This is the 3rd of 3 Disappearing 9-Patches – for this year. Since I made it the same as the Green Disappearing 9-Patch, I’m going with the same measurements. It measured about 79″ x 94″ before washing. Based on the picture, I’m guessing it’s about 75″ x 90″ after washing. Hobb’s Tuscany Bleached 100% Cotton batting was used (it’s what I had on hand). It was quilted on my DSM. I used my CarioQuilt thread in Military Gold. 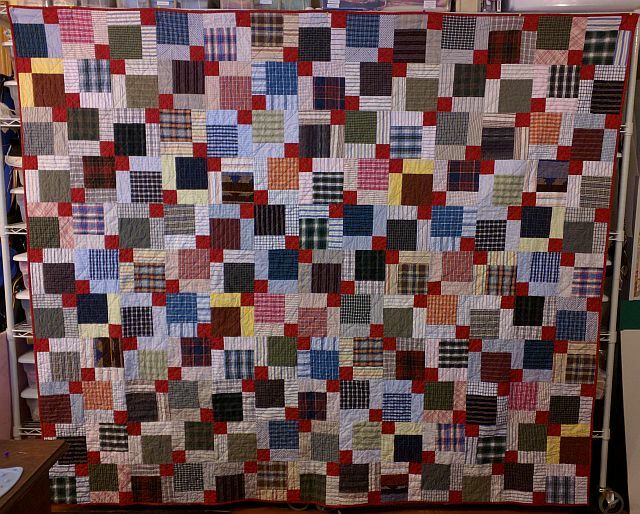 The quilting on this one is in a diagonal pattern similar to the Orange DP9. 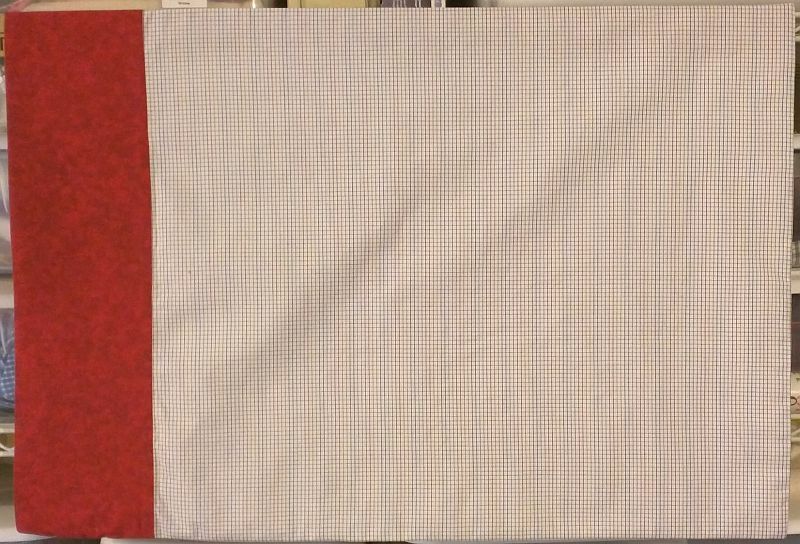 All the fabric is from recycled shirts, except for the red. I purchased two yards of it, and had enough fabric to make the quilt and a pillowcase. Again I made the cuff narrower as I needed a red cuff on another pillowcase. I started cutting the squares on May 19th, finished the top July 17th and finished the quilt on December 13th. It is on my 3rd Quarter Finish Along List make that my 4th Quarter Finish Along list that On the Windy Side is hosting and of course it is a quilt on my personal Crazy Challenge II list. Here’s the pillowcase — it’s the body of the case is from a bolt of fabric I bought several years ago.